Kofta is a traditional Lebanese grilled meat dish, very similar to a hamburger patty but with a ton more flavor. It’s usually served with pita bread, but it’s just as good sans bread and wrapped in lettuce with tomato and some fresh red onion. You can also take the raw meat and form it on a skewer, like a kabob. 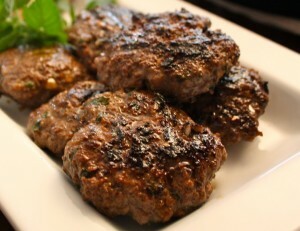 One Response to "Grilled Lebanese Kofta"